PNB Bank or Punjab National Bank is one of the popular banks in the banking sector in India. The bank offers excellent and advanced banking services ensuring convenience of its customers. With the tech advancements, the bank introduced internet banking facilities providing self-serving banking services to its customers. Do you have an account with PNB Bank? You would require Customer ID or User ID and Password to access internet banking facilities. The bank provides the Customer ID or the User ID to the customer during account opening. The Customer ID plays a major part in banking services and is useful for the bank as well as the account holder. If you have requested to activate Internet Banking services at the bank, you will receive an Internet banking kit after opening the account successfully. You can find the User ID or Customer ID in the kit. You can also obtain the Customer ID from the Passbook or Cheque Book. What is Customer ID and how is it useful? The Customer ID is unique and is provided by the bank to the account holders. If you have multiple accounts, the accounts will get linked to the Customer ID provided with the first account. Using the Customer ID, the bank officials can instantly access multiple accounts of any customer and collect banking and transaction information along with personal Details. Account holders require Customer ID to activate Internet Banking facilities for the account. How to know user id for pnb net banking login? Sir, I want to know my customer ID of pnb account. 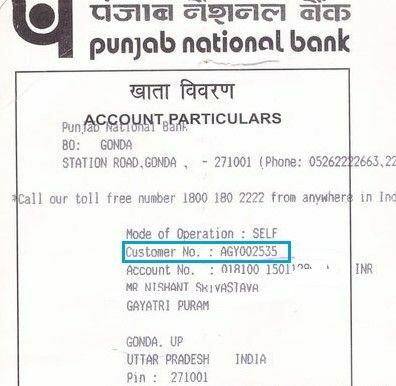 Is there any facility to get customer ID of Punjab National Bank. I need my costumer id pnb account for my account number.